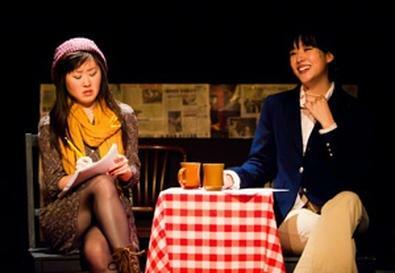 Playwright Lauren Yee lifts the veil of at-home life for the Chinese-American Wong family, where parents (Helen H. Ota and Ken Narasaki) are bent on presenting a portrait to outsiders of the perfect nuclear family at all costs—including ignoring their nerdy World of Warcraft–obsessed son, Upton (Scott Keiji Takeda), while doing everything in their power to keep their outspoken, uber-dramatic daughter, Desdemona (Julia Cho), as silent as possible. More important for the domestically challenged mother, who panics when ordering Thai food delivery ("Dear, how do you say 'Pad Thai' in Chinese? "), is appearing consummately all-American. The balance of the Wongs' tightrope existence is challenged when a traditionally dressed Chinese man (Steve Hu) is taken in by Upton as his personal indentured servant. The non–English speaking Jay, as he's dubbed in an effort to make him appear Anglicized, is expected to be able to help Upton with his math homework, but Jay has dreams of his own: to win a reality-based TV dance contest. On Chika Shimizu's simple but effective set, Peter J. Kuo directs with precise comedic skill, giving his cast free rein to poke wicked fun at the Wongs' desperate attempt to assimilate. Cho is particularly hilarious as Desdemona, who upon realizing her family originally emigrated from Mexico immediately begins to plan her quinceañera, dressing for the occasion in the most elaborately ruffled pink gown costumer Rachel Stivers could locate. Cho, with her eye-rolling teenage angst, is beautifully juxtaposed with Takeda as her whiny brother, and Hu is likewise a major treat, especially paired with Elizabeth Ho in a variety of roles, including Jay's mother and a Korean orphan Desdemona adopts online. This biting contemporary satire was an inspired choice to inaugurate Artists at Play, dedicated to "tell[ing] the stories of communities underrepresented in Los Angeles theatre," the program informs. Focusing on the shared identity crises and rapidly changing societal issues faced by modern Asian-Americans stuck in a societal purgatory between modern mores and a rich cultural heritage, Yee offers a hilarious portrait of a family that poses for its annual Christmas card photo with the mother's cheerful admonition, "Now, open your eyes wide, everyone!" Presented by Artists at Play at the Actors Company, 916A N. Formosa Ave., West Hollywood. Nov. 4-27. Fri.-Sat., 8 p.m.; Sun., 3 p.m. bit.ly/AAPCCC.